Spring and summer often see grilling season kick into high gear. With grilling season also comes an increase in fires related to the backyard grill, smoker, or hibachi. According to the National Fire Prevention Agency, about 7,900 home and yard fires in a four-year span were linked to grilling. While gas grills are linked to the most fires, charcoal grills and hibachis are not far behind. Prevent these fires by making sure your parent follows these safety tips. About 20 percent of all structure and yard fires related to grilling started because the grill wasn’t clean. Grease builds up and causes flames to get out of control. After every grilling session, your mom or dad need to thoroughly clean the grill. On a gas grill, leaving the flame burning to burn off drippings can help. After the grill cools, wipe away any grease. If the grill has a pan for catching grease and drippings, empty it. Wash and dry it before putting it back. Make Sure the Grill is in a Safe Location. Any grill should be away from the side of the house, deck rails, and other combustibles. Moving the grill to the center of an outside patio or onto the driveway is ideal. If your parent uses a charcoal grill or hibachi, the bag of charcoal shouldn’t be close to the grill. Heat could cause the paper bag to catch and set the bag of charcoal on fire. Your parent also doesn’t want it near wood plant pots like half whiskey barrels. Don’t Leave the Grill Unattended. While your parent is grilling, it’s essential to keep an eye on things. Your parent should not walk away to go in and watch a TV show while the food cooks. If a bathroom break is necessary while cooking, your parent should ask for someone to take over temporarily. Inspect Hoses and Connections on a Gas Grill. Before using a gas grill, check the hoses for damage. Make sure connections are tight. If the burner is rusted and has holes, it needs to be replaced before use. If you can smell gas when the gas valve is closed, there’s a leak. Dish soap around connections can show you if any gas is leaking. If there is a leak, have it fixed before using the grill. 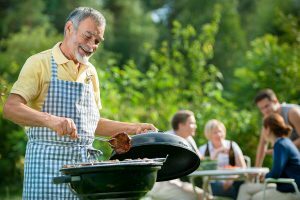 If your mom or dad lives alone, they shouldn’t grill without someone around. Even if the grill isn’t a problem, a burn could happen. If your parent gets a burn, can your mom or dad drive the car to the hospital? They can stay safe while grilling and enjoy a grilled meal with the help of a caregiver. Caregivers offer home care services that include preparing meals, providing transportation, and offering companionship. If you or an aging loved one are considering home care in Hazlet, NJ, please contact the caring staff at Lares Home Care 888-492-3538 or 732-566-1112.